With the ground home to both the Old Tauntonians and Romsey Cricket Clubs, Romsey Sports Centre’s synthetic cricket practice nets facility gets considerable use. In 2015, with the existing cricket practice nets facility at the end of its useful life – and also proving something of an eyesore – Test Valley Borough Council’s Community & Leisure Department put out an ITT (Invitation to tender) to source a supplier to design and install a new system to an ECB approved design. total-play Ltd was among seven contractors invited to go to full tender and, following a competitive bid process, was appointed the contract in July 2015. The quality of total-play’s tender submission, competitive pricing and robust solution were all cited as major reasons for its success. Also key was the company’s ability to carry out the entire project – including the demolition and removal of the existing facility – without the use of sub-contractors. In terms of the specification of the new system, total-play proposed a two lane open-ended synthetic cricket practice facility based on its ECB approved tp365 non-turf pitch design. To enhance usability, a two-tone carpet with one of the lanes featuring three white training lines running in the line of play was included. 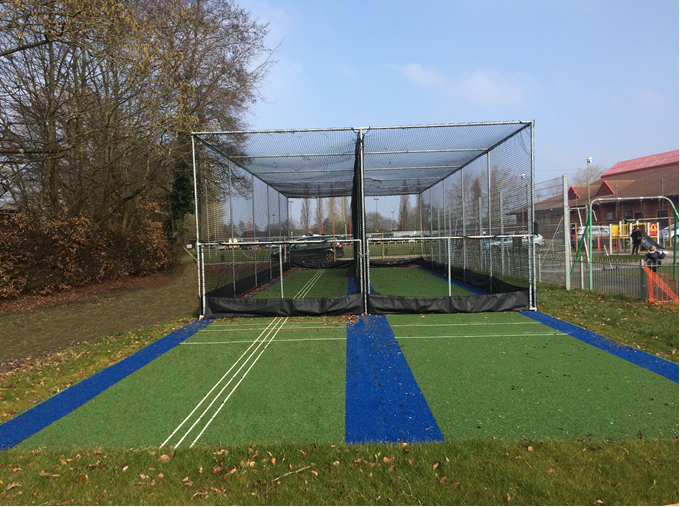 With the site located in a busy public park, a robust facility was essential and, to achieve this, a number of features including lane end gates to control unauthorised usage, an anti-rodent PVC skirt, heavy duty netting and the installation of batting curtains – aiding the privacy of users and helping focus batsmen – featured in the spec. With the design agreed, total-play’s in-house team of groundwork operatives started work on site; first removing the old facility before installing the new system. Due to works being located directly next to a busy play park, the works area was secured using Heras fencing and site access carefully planned to avoid damage to sports pitches whilst causing minimal disruption to the general public. The entire project was completed within 10 days, and is now awaiting use in the run-up to the 2016 playing season. As part of the tender agreement, the facility will also be subject to tests by an ECB approved testing laboratory to ensure it meets the ECB facility standards set out in the TS6 document. Tests will include ball rebound, surface hardness, traction and surface regularity.